Built in 2002 by local artist Bren Alvarez, the world’s tallest filing cabinet is more than a stack of 38 drawers. The tower is a piece of art titled “File Under File Under So. Co., Waiting for…” and is the artist’s commentary on bureaucratic delays building the Southern Connector roadway. The Southern Connector was originally proposed 1965 but it was never built. The still incomplete project is now called the Champlain Parkway, and is constantly held up with miles of bureaucratic red tape. The sculpture is 38 feet tall and constructed of real file cabinets welded together on top of each other. Each drawer represents the number of years of paperwork that Alvarez accumulated while working on the project. 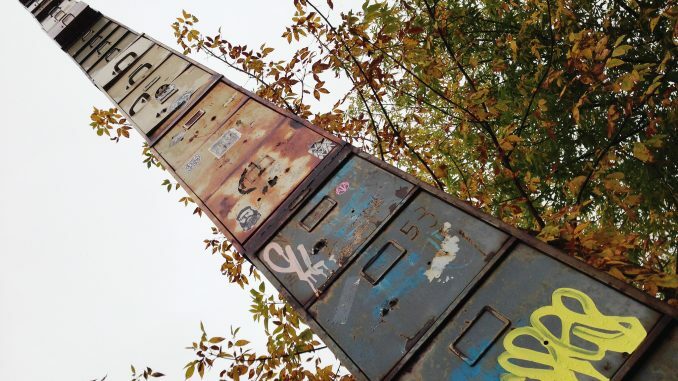 While the artist claims that it is the tallest filing cabinet in the world, this is unconfirmed, and there are others around the world making the same claim. The art instillation is located on the Southwest edge of Burlington at 208 Flynn Ave.